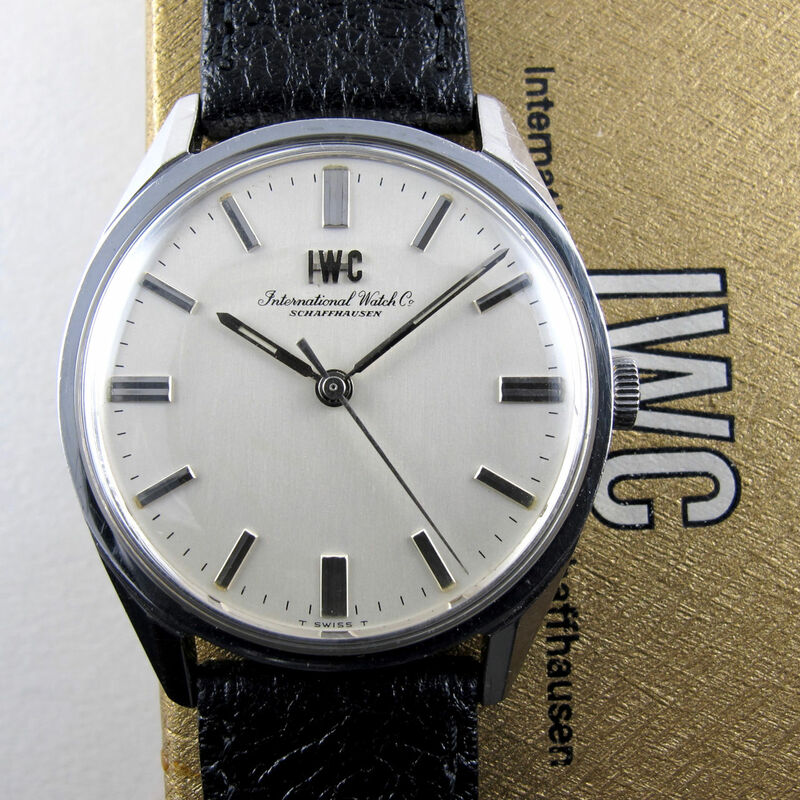 This week’s newsletter opens with a very handsome example of the IWC Ref. 810, this watch has a silvered dial that retains an excellent lustre to the surface. The model incorporates the legendary calibre 89 which is greatly favoured by collectors of the brand for its superior quality and finishing – it is also the calibre used by this watchmaker in their famous IWC military Mark XI. Cased in stainless steel, the watch has a flat bezel, screw-down case back and is fitted with its original winding crown featuring IWC’s fish logo. The case’s angles and edges retain good definition and we have not had the watch polished during servicing, there are therefore are some light scuffs and scratches to the case. 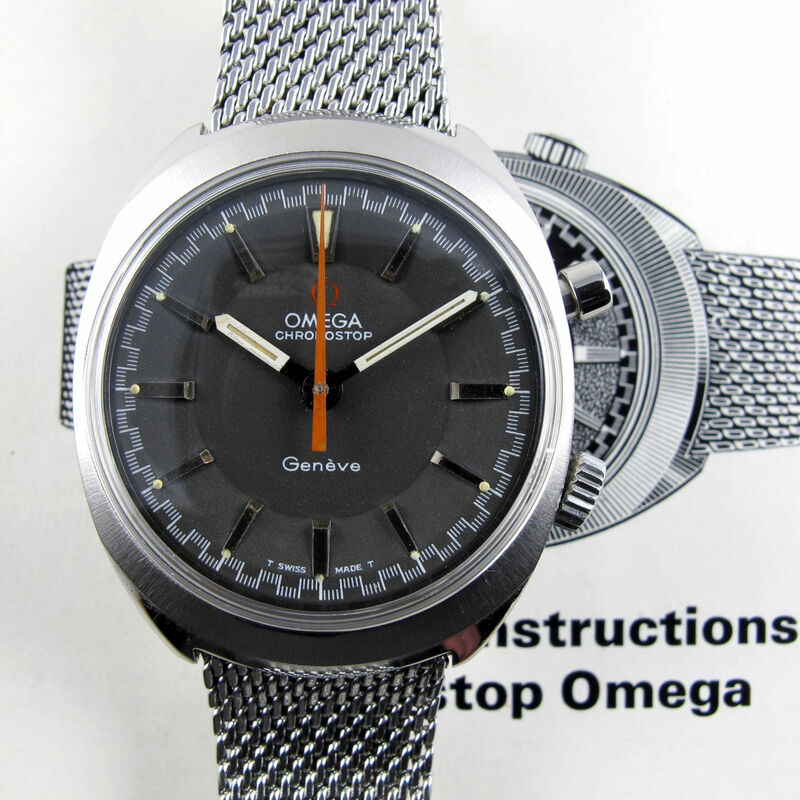 A great example of the Omega Chronostop, this watch is in lovely condition, retaining its original documentation and specially designed steel bracelet. The chronograph movement allows the centre seconds hand to be used either as a constant seconds hand or to time events up to one minute in duration. The pusher for the chronograph will start the seconds hand running when pressed for the first time, pressing a second time will automatically zero the seconds hand to the 12 o’clock position. This function can also be used to synchronise the watch to a time signal if the seconds hand is kept in its running position. The original Omega steel mesh bracelet has a long adjustable folding clasp. In quite extraordinary condition, this pocket watch appears to be almost unused. The dial is sensational with strong two toning; the dial centre has a high satin sheen whilst the chapter ring has a matt finished surface. To the edge of the dial, the minute track is pearled and gilded to provided added contrast. The nickel-chrome case retains superb definition with multi-stepped bezels to the front and back of the case. This wristwatch has a beautiful silvered dial with gold foil Arabic numerals and gilded leaf-shaped hands. 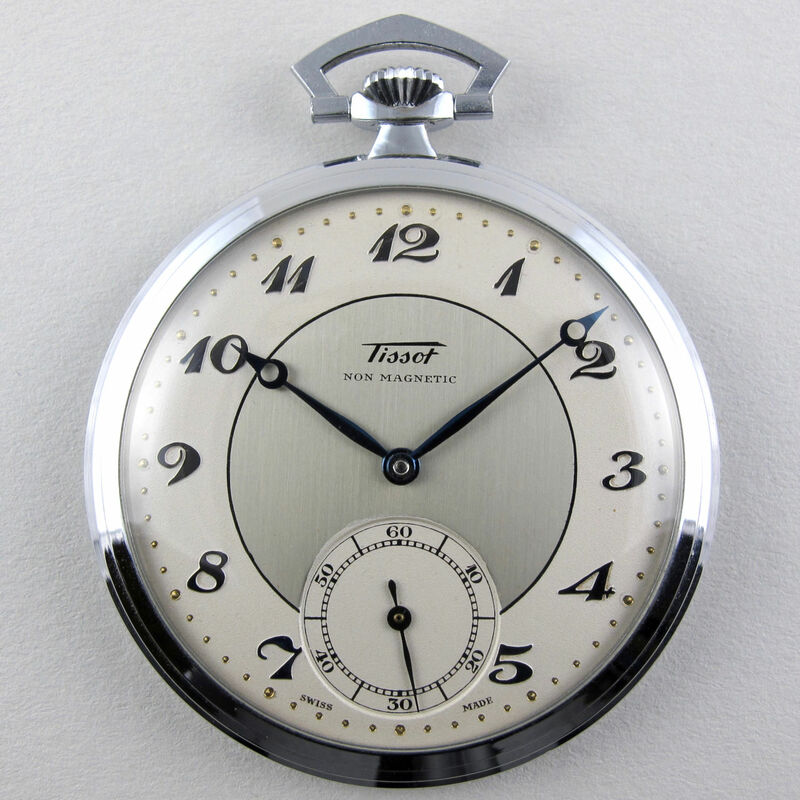 The dial retains a wonderful lustre with very light and even oxidation. Cased in 9ct gold, the design is classic with a chamfered bezel, gently down-turned lugs and a snap-on domed case back. 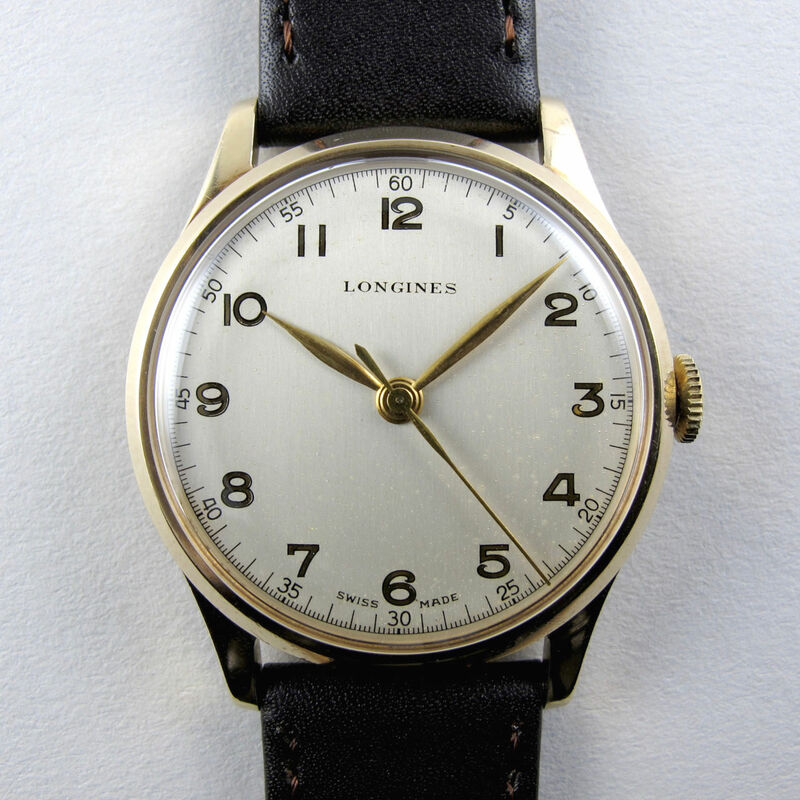 The watch is powered by Longines’ excellent calibre 12.68ZS. 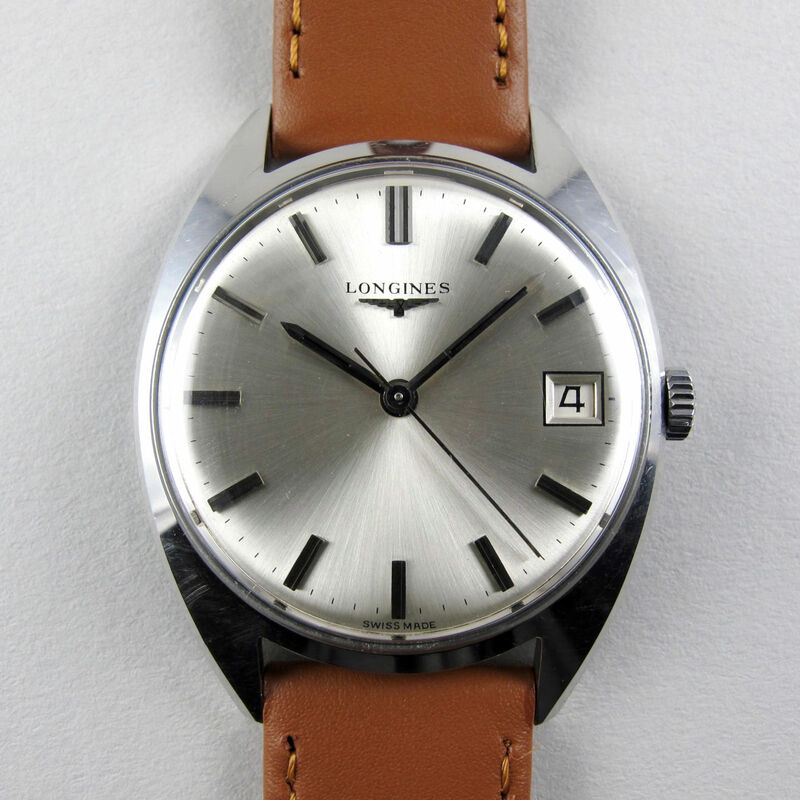 This is a relatively rare Longines model with a sharp, tonneau-shaped design. The upper case has no separate bezel which gives the watch a sleek design and the polished chamfered edges accentuate the watch’s crisp, linear layout. In lovely condition, the case has not been polished during servicing in order to maintain its well defined angles and edges, there are therefore some light scuffs and scratches to the surface. A sharp example of this surprisingly unusual de Ville model from the mid 1970s. The watch has a smart silvered dial with a vertical satin finish and slim applied baton indexes which have blackened surfaces. Cased in stainless steel with a two-part construction, the solid upper body entirely integrates the bezel. In excellent condition, the case and dial are both wonderfully crisp. 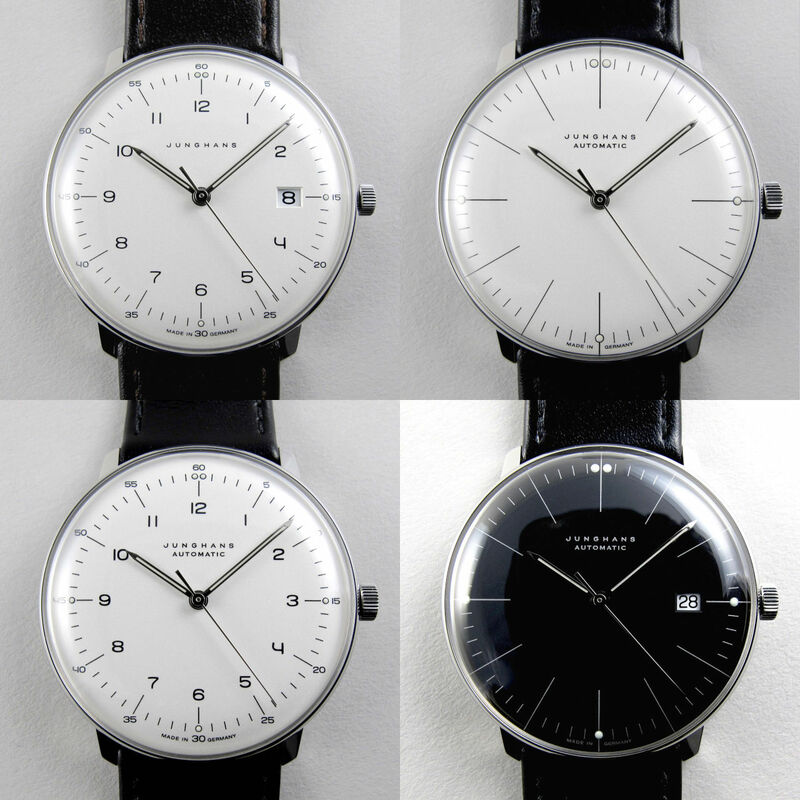 We’re really excited to be able to bring you a new range of contemporary watches by Junghans. In 1961 Max Bill designed his first wristwatches for Junghans having already produced clocks for the firm in the 1950s. Studying at the Bauhaus in Dessau and later setting up his own school of design, the aesthetic values that Bill developed and honed were brilliantly translated onto the dials of his watches. Bill’s watches were ideally suited to the 1960s, an era that witnessed an increasing focus on clean, pared-down designs in which the emphasis was on utility and clarity of display. The contemporary Max Bill series of wristwatches are, in design, little changed from the originals and this is most clearly demonstrated in their use of slim baton indexes and specially created Arabic numerals. These iconic modern watches are produced by Junghans in consultation with the heirs of the designer and the Max, Binia & Jakob Bill Foundation. We have 6 wristwatch models all following Max Bill’s designs. 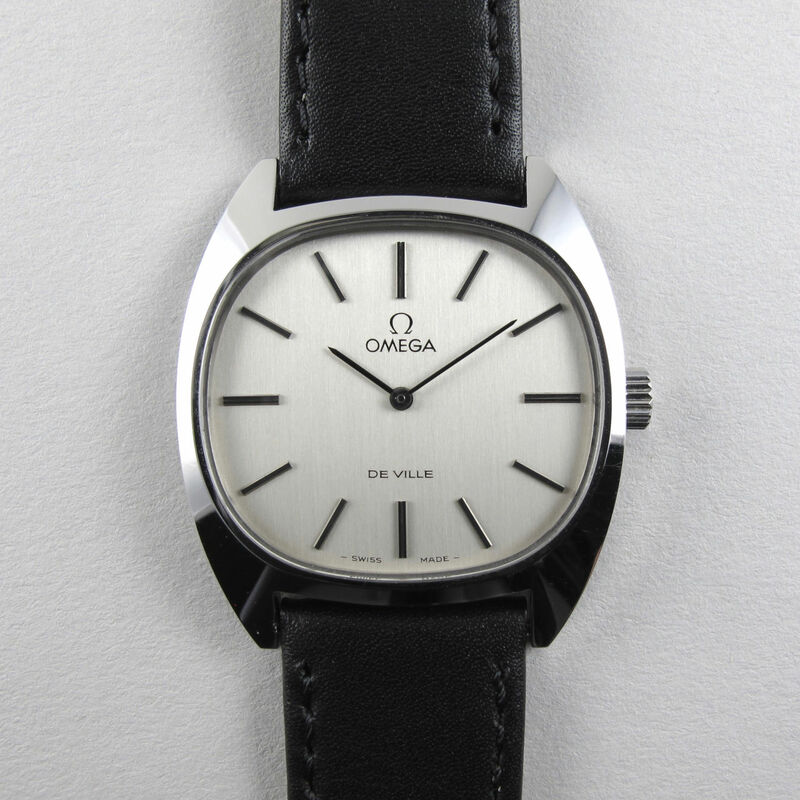 There are 5 mechanical automatic models – 4 with date and 2 without, there is also one quartz model with date. These watches are splash proof and have a 2 year manufacturer’s guarantee. 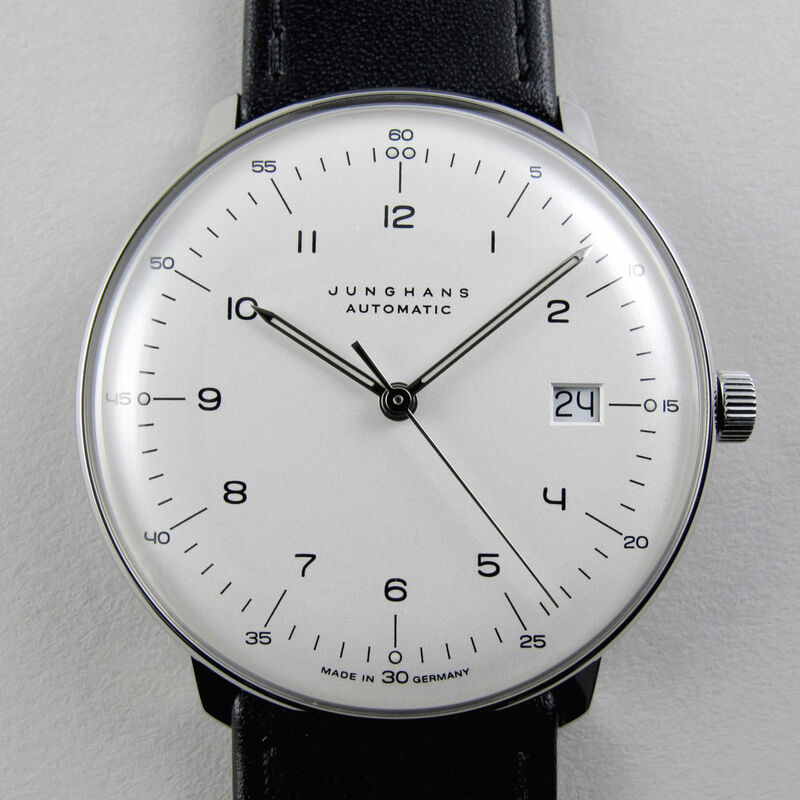 As we are now an official Junghans stockist, all these watches will be accompanied by a Junghans presentation case, guarantee and instruction booklets and a branded polishing cloth. silvered dial version has a very fine grain-matt finish. Both are cased in stainless steel with screw-down case backs and unusual chronograph pushers that fit brilliantly with the overall Max Bill design aesthetic. 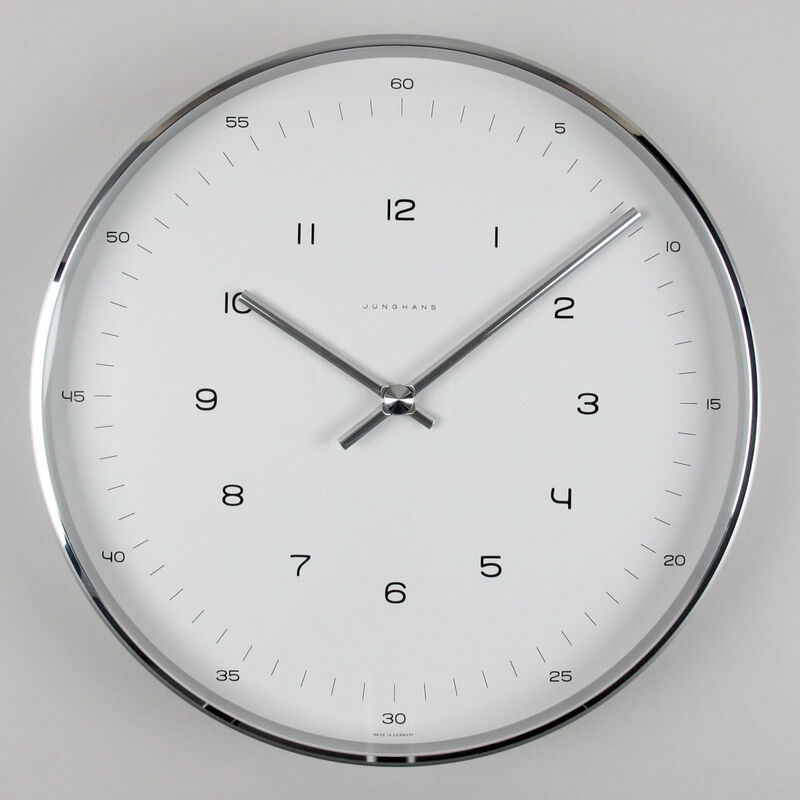 Max Bill was first approached by Junghans to design a kitchen clock and this super stylish wall clock is based on an original that the artist produced in 1956. The dial has an ultra-clear layout with an inner ring for hours and a clearly separated outer minute track. The case is made from satin finished aluminium and the bezel has a polished finish. It would look perfect in pretty much any room. For more information on Max Bill himself, head over to our Journal where you’ll find a brief potted history together with pictures of the man himself and some of his creations. To automatically receive these updates via email you can sign up HERE.